We're now mere hours away from learning the full scoop on Amazon's much-discussed new Kindle e-book reader. The Kindle DX, as it's rumored to be named, is expected to be revealed at a news conference Wednesday morning. Despite the lack of officially released details -- let's face it, Amazon isn't exactly known for forthcoming public relations -- the Web is filled with oodles of alleged insider information. Here's a complete rundown of all the latest speculation. • Amazon's Kindle DX will be big. The key feature of the Kindle DX is its size (sorry, fellas, but that sometimes does matter): The DX is said to have a 9.7-inch display. That's nearly 4 inches larger than the current Kindle 2's 6-inch offering. • The Kindle DX will be built with newspapers and magazines in mind. The new Kindle is expected to be tailored specifically for displaying newspapers and magazines. 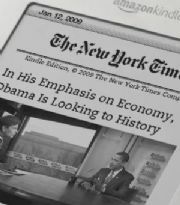 The distinction may come down largely to the screen size: As The New York Times points out, the extra real estate could allow publications to more closely mirror their print formats, building a mix of editorial and advertising content into the space and thereby generating additional revenue. The Times, in an oddly vague sentence about itself, notes that it is "expected to be involved in the introduction of the device." Some rumors suggest the paper's current Kindle subscription fee of $13.99 a month will drop down to $9.99 a month on the new device. A number of other publishers are thought to be on-board as well. • Amazon's new Kindle will also have a classroom tie-in. The Kindle DX is expected to be optimized for textbooks, too. At least six schools are believed to be involved in a "pilot program" in which they'll hand out Kindles to incoming freshmen and allow them to get textbooks on the devices. Pace University, Case Western Reserve University, Reed College, Arizona State University, Princeton University, and the Darden School at the University of Virginia are the institutions that have been named. • Lots of new software features will be included in the new Kindle. Amazon's updated Kindle is said to come loaded with a build-in PDF reader and a "more fully functional Web browser" than its predecessor. The DX is also rumored to have a new function that'll allow you to create annotations within texts, in addition to the standard highlights and notes. • The Kindle DX won't be alone. A handful of other companies are supposedly working on similar newspaper- and magazine-friendly reader devices. Hearst, USA Today, the Financial Times, and News Corp. are all said to be involved in device-making deals. Even Apple, by some accounts, could be working on a periodical-ready tablet that could compete directly with Amazon's Kindle DX. PC World will be there. Stay tuned for the full story.